Cinnamon health benefits have been known for a number of years. The herb comes from a small tree which is cultivated in the East. As a spice, it is used in the form of a powder or a stick and has been used in cooking for centuries. It can be used to fight off colds and flu and it has a beneficial effect on the circulation. Ayurvedic medicine has used cinnamon for diabetes treatment. Recent studies show that cinnamon has a positive effect on blood sugar levels by regulating them and increasing insulin production in the body. It is effective against insulin resistance, which is often considered to be a condition that leads to diabetes, and cinnamon has also been shown to actually prevent the disease. The study was carried out on a water soluble cinnamon extract, but cinnamon capsules can also be taken if preferred. Cinnamon is good generally for the health of the digestive system, keeping it functioning properly. This is beneficial for weight loss, as the health of the digestive system and elimination of waste is very important in controlling excess weight. Combining cinnamon with honey and making it into a tea provides a warming drink that can kick start the metabolism. The spice has a thermogenic effect on the metabolism, which encourages the body to burn calories more efficiently. Cinnamon health benefits extend to controlling cholesterol levels. Adding just half a teaspoon of cinnamon to your daily diet can help to reduce cholesterol levels. Cinnamon is easily added to the diet, as it can be used as a spice in food or used to sweeten hot drinks like tea or coffee. It also has the ability to reduce only the “bad” cholesterol, known as LDL cholesterol, while not effecting levels of good cholesterols (HDL). Cinnamon should only be used to treat diabetes under a doctor’s supervision, particularly if on prescription medication. High doses of the spice can cause liver problems and can thin the blood, so those on prescription medication for blood thinners should not take large amounts of cinnamon supplements. An excessive amount of the oil of cinnamon can damage the central nervous system. Pregnant women are advised not to use a cinnamon supplement and only small amounts of the spice in their diet. 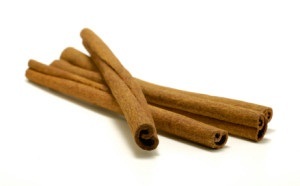 The health benefits of cinnamon extend to its aromatherapy use as well. Oil of cinnamon is a concentrated form of the spice taken from the bark of the plant and is not for internal consumption. The wonderfully-scented cinnamon essential oil can be used in aromatherapy to benefit memory function and enhance concentration. The extract is an easy form of administering the spice, as it is water soluble. For those reluctant to use the fresh spice or extract, cinnamon capsules are available as a supplement and can be administered several times a day with plenty of water.